By far the prettiest of the Cocktails in the Park with George colors/drinks to my eyes, the Viridian cocktail moves from the oranges and yellows of the previous lot into cool blues and greens (without the Windex blue we will see shortly), with a hex value of #40826D and some cool ingredients as well. Magellan is a French brand whose gin offering has a unique blue hue from the infusion of iris flowers. It’s subtle, but a neat effect, and serves as the perfect base for this drink. You might notice that most of the other ingredients are found (along with gin) in the immaculate Last Word cocktail. 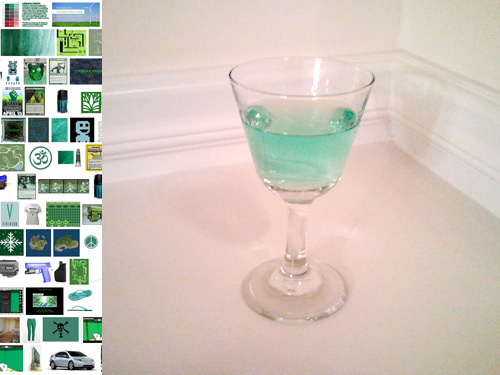 The Green Chartreuse added the necessary green tint to the drink, and from that point I didn’t see much reason to stray from the Last Word’s path, adding in the Maraschino for its sweetness. However, lime juice from the Last Word set the color off too much from my desired end result so I turned instead to some dashes of acid phosphate, an ingredient once widely found in soda fountains that I will admit I picked up as a lark and hadn’t yet utilized much. Here, though, it added a nice bit of tartness without affecting the color in any way. The salt water? Dunno. Felt like it needed it. Sometimes I don’t have a reason beyond that.